If some pump light, typically at a shorter wavelength than the signal to be transmitted, is injected into the fiber, that pump light is absorbed by laser-active ions. These are excited into some metastable states, i.e., excited electronic energy levels with a relatively long upper-state lifetime. 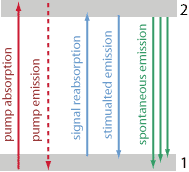 The excited ions can now amplify signal light via stimulated emission: the signal light brings the ions down to a lower level (often the ground state manifold) and takes the excitation energy with it. Importantly, the stimulated emission always goes into the same mode of the light which causes it. Therefore, we really get amplification of the signal light, rather than e.g. just enhanced fluorescence going into all directions. Figure 1: Energy level structure of the trivalent erbium ion, and some common optical transitions. As an important example, consider what can be done with trivalent erbium ions (Er3+), as are utilized in erbium-doped fiber amplifiers. Figure 1 shows the Stark level manifolds of these ions and some important transitions between them. For now, we consider these Stark level manifolds as simple energy levels, even though we will have to reconsider that later on. For simplicity, let us count the level manifolds from the bottom; for example, let us denote level 4I13/2 simply as level 2. The transition from level 2 to 1 can be used as the laser transition for amplifying light in the 1.5-μm wavelength region, which is often used for optical fiber communications. The used pump light often has a wavelength near 980 nm. This actually pumps ions from the ground state (level 1) into level 3. From there, ions in the fiber glass quickly decay to level 2. 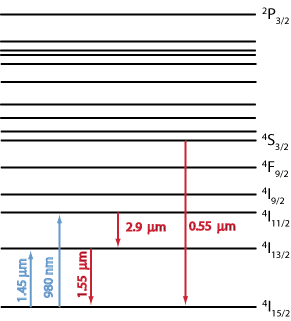 In the mostly used silica fibers (more precisely, fibers with silica-based materials), this is mostly not due to emission of light around 2.9 μm, but rather by much more rapid multi-phonon transitions, i.e., by emission of multiple phonons (quanta of lattice vibrations). The upper laser level (level 2) is quite long-lived, with an upper-state lifetime of the order of 10 ms. When an ion gets down again to the ground state manifold (level 1) via spontaneous or stimulated emission, it can again be pumped. As the non-radiative transition 3 → 2 is rather fast, the level scheme used in a model can often be simplified. One assumes that the mentioned transition takes no time at all – with the consequence that at any time an ion can only be in level 2 or level 1. Here, we also neglect possible excitation into higher-lying levels, e.g. via energy transfer processes, which are weak if the erbium concentration is low enough, or via excited-state absorption, which does not occur for the typically used pump wavelengths. Instead of pumping at 980 nm, we can also use a pump source around 1.45 μm, which puts the ions directly into level 2; this is called in-band pumping. Figure 2: Due to the energy distribution within the Stark level manifolds, pump and signal light with different wavelengths can interact with the same pair of manifolds. Well, text books will tell you that laser amplification is not possible with a two-level system, since the pump wave will then also cause stimulated emission, and a population inversion cannot be reached. That is true in principle, but not applicable to our case, as we are dealing not with real energy levels, but rather with Stark level manifolds, each consisting of multiple sub-levels. These have slightly different energies, depending on the local electric fields. Different ions in the amorphous glass material see different fields, and overall we have a kind of “smeared out” distribution of level energies, shown as gray bars in Figure 2. Now what happens here is that the pump wave, having a somewhat shorter wavelength (and thus a higher photon energy) than the signal wave, preferably pumps ions into the higher sub-levels of manifold 2. Within each manifold, there is a very fast thermalization (within picoseconds), so that at low temperatures (like room temperature) the majority of ions will always be in the lower sub-levels, from where pump light cannot reach them any more. Therefore, stimulated emission by the pump wave is weak. However, the slightly longer-wavelength signal light is more effective for stimulated emission. In turn, it is less effective for absorption, since absorption with its low photon energy would require ions in the higher sub-levels of manifold 1, which are again only weakly populated at low temperatures. This section is somewhat technical. If you are not interested in learning the physics details and how to calculate the behavior of a fiber amplifier, you may skip the next few paragraphs and resume reading near Figure 4. Looking at the spectroscopic details, one may get the impression that the situation is horribly complicated: We have a statistical distribution of actual energy levels (the sub-levels of each manifold), and for any optical wavelength, transitions between multiple sub-levels can occur. It will be extremely hard to find out the statistical distribution of energy levels in our glass and the wavelength-dependent transition cross sections for each pair of sub-levels. So how should we ever manage to model this system? We do not care about where exactly the ions are, but only care about the total populations of the two Stark level manifolds. Due to the rapid thermalization within the manifolds, we essentially always have a well-defined distribution of ions on the different sub-levels (a Boltzmann distribution). (Only in some extreme cases with intense ultrashort pulses, there may be significant deviations from that assumption.) So there are no additional free variables which we would have to take into account. 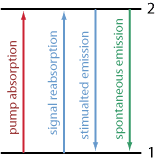 If we consider pump and signal light both as monochromatic, each of these will in general have some absorption cross section σ12 and an emission cross section σ21 (with different values for pump and signal). Figure 3: Simplified model for Er3+ ions. There are two levels considered, called level 1 and 2. Ions can be deexcited by stimulated emission with signal light. Also, signal light may be absorbed to excite them again into level 2. (That is called signal reabsorption.) For these things, we have the parameters σ21s and σ12s. From level 2, the ions can also get down by spontaneous emission. We will have a constant transition rate A21 = 1 / τ2 for ions in the upper state, where τ2 is the upper-state lifetime. for the fractional level populations n1 = N1 / Ndop and n2 = N2 / Ndop. (We normalize the ion densities to the overall erbium doping concentration.) Of course, one of the equations is redundant, as we always must have n1 + n2 = 1. For in-band pumping, stimulated emission terms for the pump would have to be included in addition. It would also be easy to insert terms for additional waves with other wavelengths. Note that the equation system is linear and therefore easy to solve. For the steady state with given optical intensities, we can simply set the left side to zero and solve for the upper-state population n2, using the relation n1 + n2 = 1. A more complicated rate equation system is needed if one does not neglect the time for the nonradiative transition 3 → 2, or if one includes excited state absorption and energy transfer effects. With the latter, the equation system gets nonlinear and thus more difficult to solve for the steady state. Of course, suitable software makes it easy to handle even such cases. 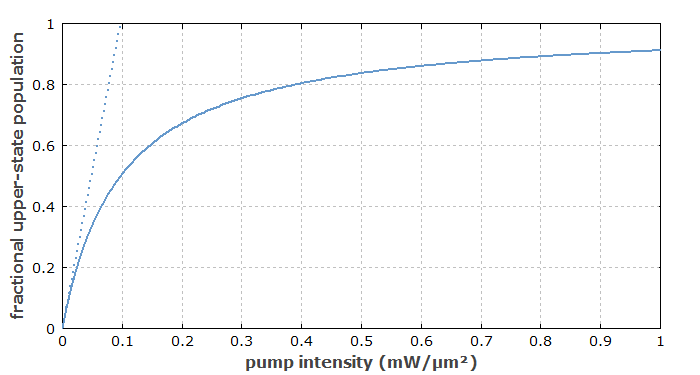 Figure 4: Upper-state population versus pump intensity in an erbium-doped fiber. The underlying spectroscopic data are for an erbium-doped germanoaluminosilicate fiber and a pump wavelength of 980 nm. For increasing intensity, the upper-state population first increases linearly (dotted line) but then levels off; it approaches 1 (= 100%) for high intensities. Note that with a moderate pump power of 100 mW put on an area with radius 5 μm, we already get a pump intensity of 1.27 mW/μm2, i.e., a value beyond the axis range in our diagram. We see that we easily get strong pump saturation in a fiber: the substantial upper-state population means an accordingly reduced lower-level population and thus reduced pump absorption. For Yb3+ ions, having higher absorption cross-sections particularly around 975 nm, pump saturation effects can be even much stronger. 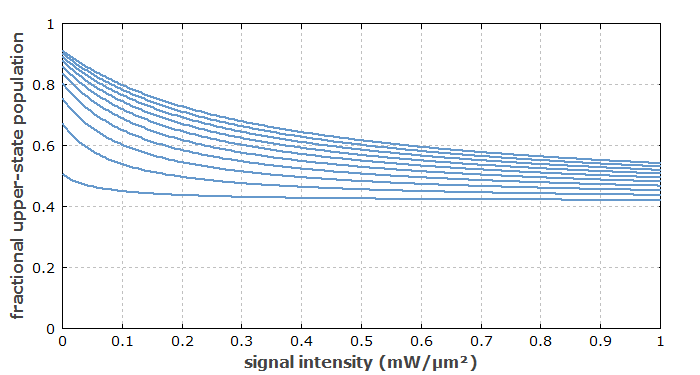 Figure 5: Upper-state population versus signal intensity at 1550 nm in an erbium-doped fiber. 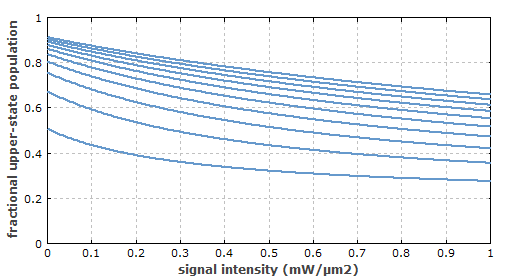 The curves apply to pump intensities from 0.1 to 1 mW/μm2 in steps of 0.1 mW/μm2. For increasing signal intensity, the upper-stage population does not go to zero, but rather approaches some finite value (here: 42%). This is because of the signal reabsorption. For high intensities, there must be a balance of absorption and stimulated emission events. The curves for higher pump intensities start out higher, but again we see the pump saturation. The signal saturation power, calculated with a common formula which assumes a constant pump rate, is only 0.030 mW/μm2. However, the curves for higher pump intensities show that strong signal saturation in fact requires much higher intensities. This is because the pump rate is in reality not constant, as it is reduced by pump saturation. For a constant pump intensity and increasing signal intensity, the pump rate increases because the ground-state population increases. Rapid repumping of the ions makes the resulting amplifier gain “stiffer”. Figure 6: Like Figure 5, but for a longer signal wavelength of 1600 nm. These examples have already shown that both signal reabsorption and pump saturation effects have a substantial influence in fiber amplifiers, so that one can be entirely mislead when using some basic textbook knowledge for other amplifier systems where these effects can be ignored. Go to Part 2: Gain and Pump Absorption or back to the start page.